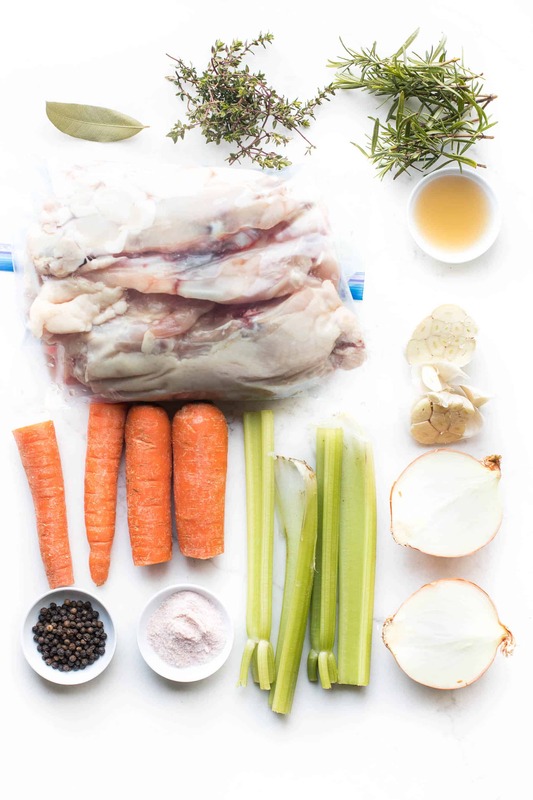 Paleo, Whole30 + Keto Instant Pot Chicken Stock Bone Broth Recipe + Video – make your own tastier bone broth at home for a fraction of the price. Use in soups, sauces, or sipping! Gluten free, grain free, dairy free, sugar free, soy free, clean eating, real food. 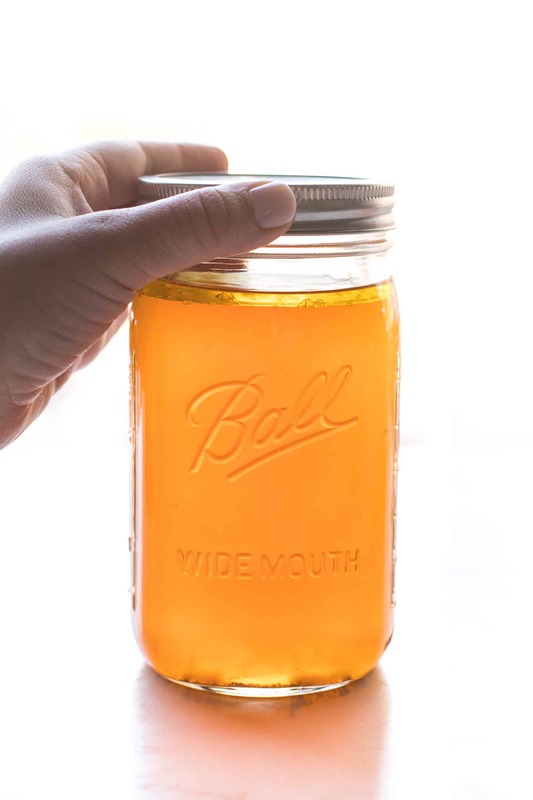 There are not words sufficient enough to explain how phenomenal homemade bone broth tastes. When you taste it, you will never buy it again. 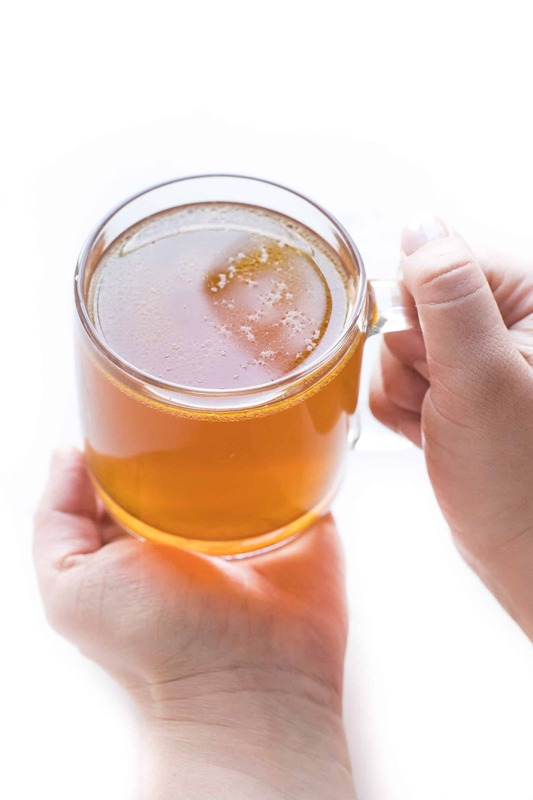 I’m sure you’ve heard all about bone broth. It’s great for you gut, your bone + joint health and your immunity. 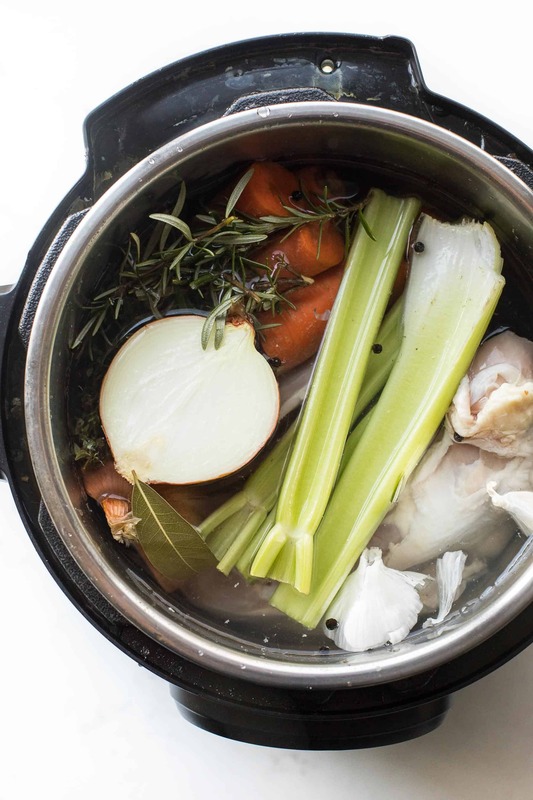 Bone broth supports weight loss, better sleep, and it helps fight inflammation. Plus it is packed with vitamins and minerals. 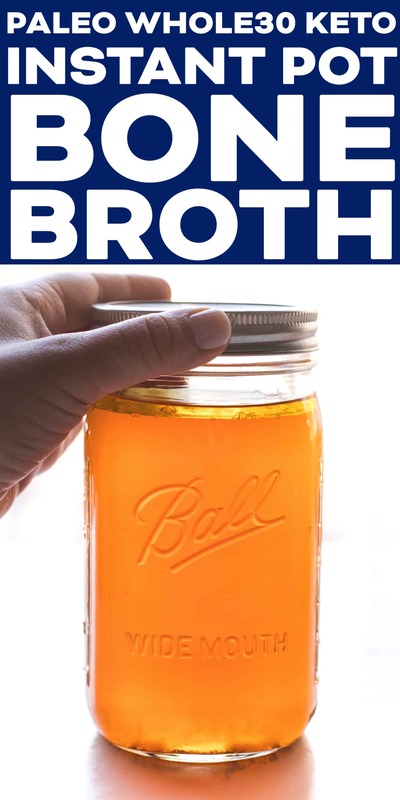 I use bone broth as I would chicken stock or chicken broth. 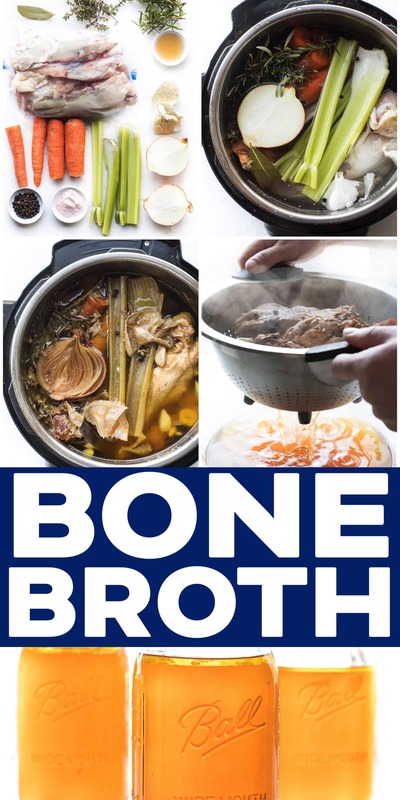 Bone broth is perfect for soups and sauces, braising meats, or as a flavorful ingredient in meatballs. I get all of my chickens from ButcherBox (which I highly recommend!). They are the absolute best source for pastured chickens that are hormone and antibiotic free. To get the most value out of my ButcherBox order, I get whole chickens and break them down myself. I have a whole post on how to break down a whole chicken, and I save the carcass and all the bones for bone broth. This recipe needs the carcass and bones of 2 whole chickens. We eat 2 chickens a week, so I have enough to make a batch of bone broth once a week. If you are in a pinch, you can also buy chicken backs from your butcher. I’ve gotten them at Whole Foods before. They’re very cheap. This isn’t a bone broth that gels. If you want that, you need to use at least 4 chicken feet since they have such a high amount of cartilage. The instant pot has completely changed my life by how much it has simplified making bone broth. Before, I would simmer in on the stove for 24 hours and my house would smell so strongly of bone broth for days. Now, I can make it in the instant pot for 3 hours, and it contains all of the smell! I add all the ingredients to my 6 quart instant pot, add in the chicken carcass and bones (if the carcass and bones are frozen, I throw them in frozen! It’s amazing!). I cook it over manual pressure for 3 hours, then strain it and it’s ready. 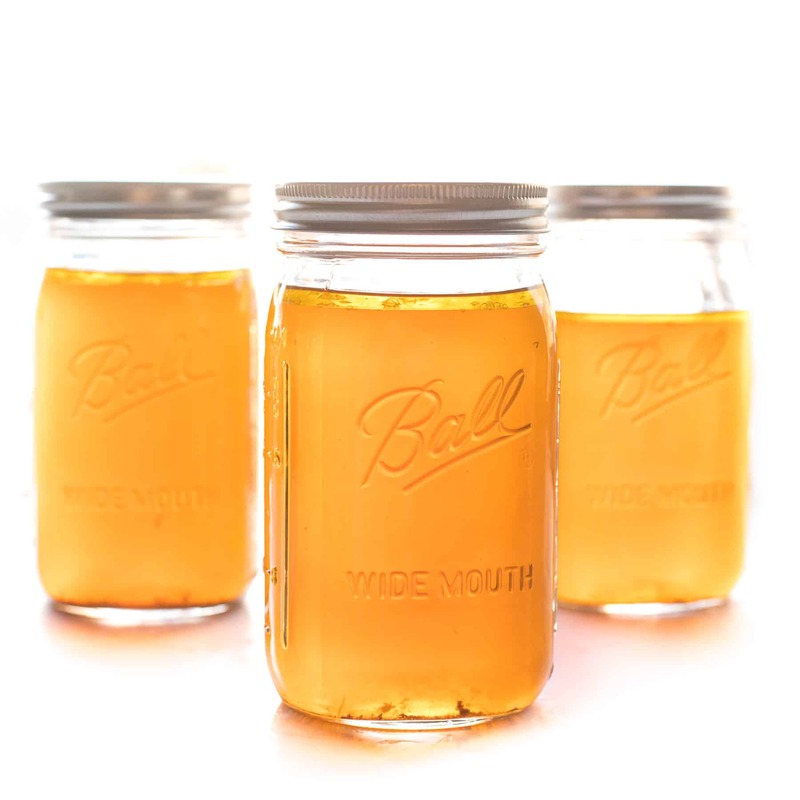 I love storing my bone broth in quart mason jars. If I’m refrigerating them, I’ll fill the jars all the way to the top. If I’m planning on freezing the bone broth, I will fill the jars just below the crook in the neck. About 3 cups worth. Bone broth will last for at last 1 week in the refrigerator. Just check for spoilage. It will last for at least 6 months in the freezer. Add all the ingredients to your Instant Pot, then fill with water until it reaches the 2/3 full line. Close your Instant Pot. Make sure the pressure valve is in the closed position. Press MANUAL PRESSURE, and set the timer for 3:00 hours. 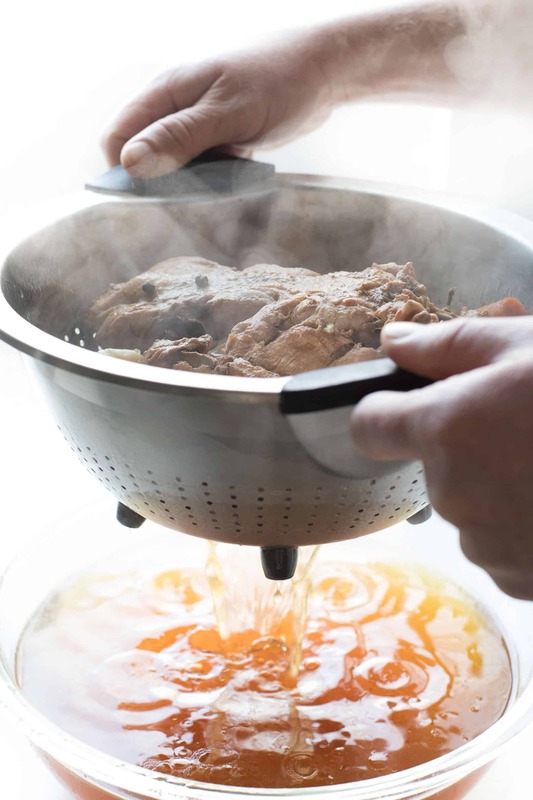 After it is done cooking, allow the pressure to naturally release for at least 15 minutes. After that you can do a quick release. Put a colander over a large mixing bowl. Pour the bone broth into the colander. Lift the colander to strain out all the solids. Discard the solids. I like the chicken fat in my bone broth, so I leave it. If you don’t want the fat, you can wait until it cools and spoon off the fat from the top. 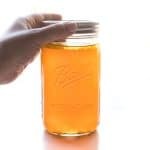 Transfer the bone broth to quart mason jars. Fill up to the top if storing in the refrigerator. Fill up to just below the neck if storing in the freezer (about 3 cups worth). Will keep in the fridge for at least 1 week (just check for spoilage), or in the freezer for 6 months. You can see this post to learn how to break down a whole chicken, and save the carcass and bones for bone broth. If your carcasses and bones are frozen, throw them into the instant pot frozen. No need to adjust the cooking time. You could substitute about 4 to 6 chicken backs if you don’t have chicken carcasses and bones. Ask your butcher for them. I’ve gotten them at Whole Foods before in a pinch. They’re very cheap. I like the fat in my bone broth. If you don’t like it, skim it out once it cools. 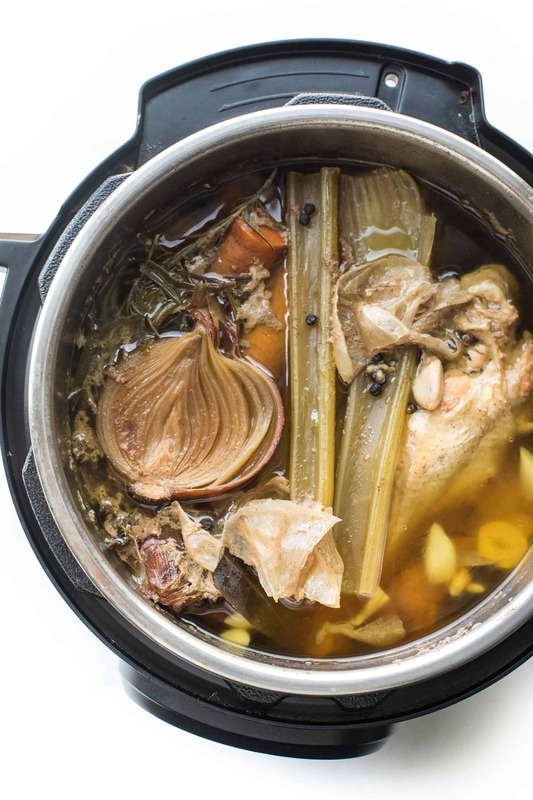 Can your bone broth be made without an instant pot, like with a crock pot? Would you recommend? Yes! You would just need to cook the bones on low heat for about 24 hours. I’ve made it in the crockpot before and it works! But honestly, it tastes better, cooks faster, and it doesn’t fill your house with such a strong bone broth smell when made in the instant pot. It’s the main reason I got one. So if you’re on the hunt for one, I highly recommend this one! On sale for less than $90!